This article is 1908 days old. 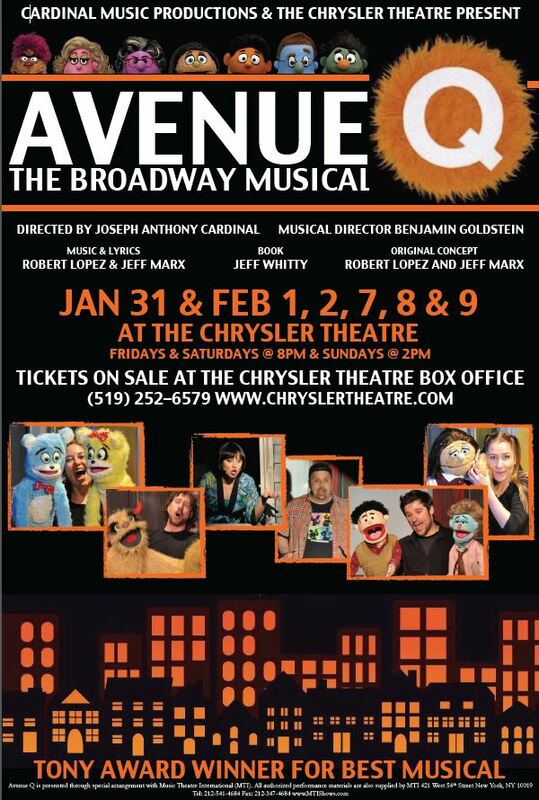 Avenue Q hits the stage of the Chrysler Theater this weekend and next. Avenue Q is a laugh-out-loud musical that tells the timeless story of a recent college grad named Princeton who moves into a shabby New York apartment all the way out on Avenue Q. He soon discovers that although the residents seem nice, it’s clear that this is not your ordinary neighborhood. Together, Princeton and his new-found friends struggle to find jobs, dates, and their ever-elusive purpose in life. Show times are Friday and Saturday at 8pm and Sunday afternoon at 2pm. Tickets range from $25 to $30 and can be purchased online here . The play is not suitable for children under 14 and parental guidance suggested.